The last time i had a great salad (The Avocado & Chicken) was at the Yari Road eatery - Barrio. The Salad was alluring with such depth of textures and flavours that it put me into a culinary coma. 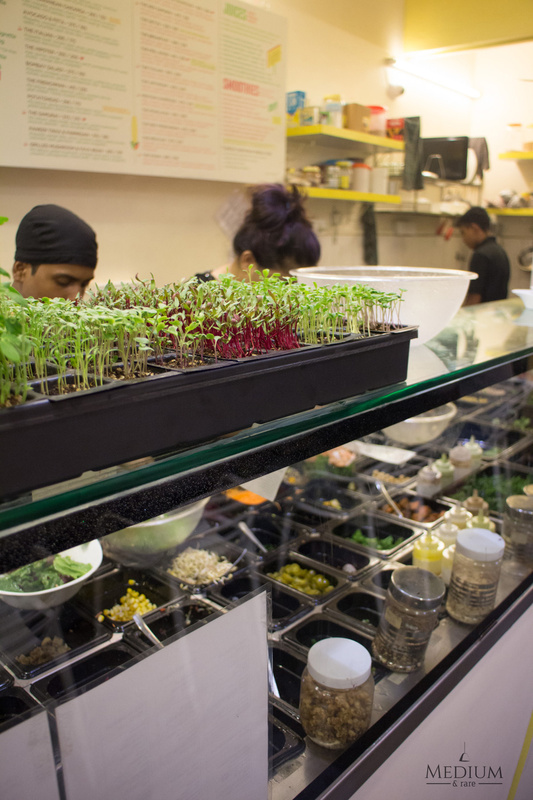 'Karishma Dalal' who in her previous endeavours chef'd in the kitchens of Taj Hotels, later helmed Suzette & then Barrio now shows her liberal love towards salads with her venture called 'Bombay Salad Co.' at 16th Road, Bandra. After a couple of hard luck tries in the past week, i finally managed to get a table here. The table was exactly as wide as my shoulders and the next table seemed like an extension of my table itself. So much so, i overheard how this woman was envious that her friends were making trips to Europe and how she wanted her wedding reception arrangement table to be. Bombay Salad Co. or Karishma - If anyone of y’all are listening then please make some space for people. Removing one table each from the al-fresco and the inside can really help people feel at ease. My order seemed too cliché for a post workout meal - Whey Protien, Apple, Almonds & Banana Smoothie followed by Detox Salad. Last evening the service seemed to have some teething issue where my salad bowl only reached the table after exactly 25 minutes upon placing the order. The Smoothie was nutty, refreshing and rich all at the same time. The glass came with a quite a dash of sliced almonds *ThumbsUp*. 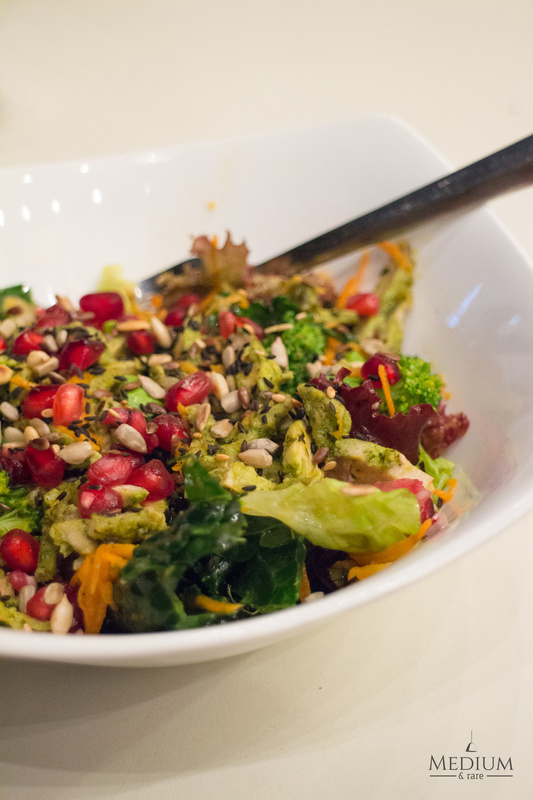 The Detox Salad looks as colorful as a Lego set with deep green from Kale leaves, mixed Lettuce & Brocolli while the warmer tones came from the Pomegranate, baked Fish & mixed Seeds. Taste-wise it was almost impeccable that each bite consists of a crispy, chewy and a slippery element. The Orange Carrot Vinaigrette seemed like a side kick. A tad bit more of the zest from the vinaigrette and the salad would have been a masterstroke. Surely there will be a couple of more visits, but only once the fad has subsided and the service is quick and there's space enough to stretch my arms and not knock off anyone on the side. 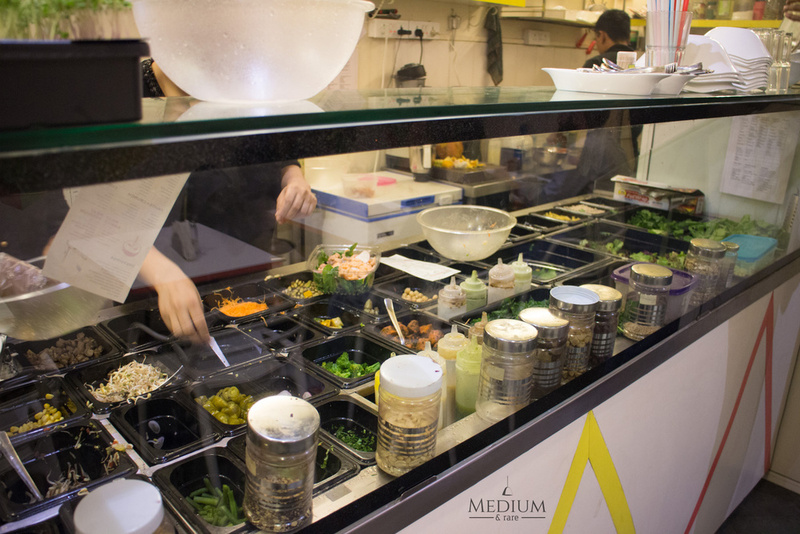 In a nutshell it's great go-to place for some with a fervent for Salads & Smoothies or Anyone looking to dine out with some counted calories. Ciao ! Location : 16th Road, Next to Kareem's. Just opposite to Hawaiian Shack. My first interaction with this Burmese hot-pot dish was at friend's place for a potluck lunch around 8 years back. The fact that i gobbled bowl after bowl of this curry and rice combination didn't go down well with my girlfriend cause of the fact that i was relishing a dish that her friend had bought to the lunch ! Guys, Never ever do that ! There are some serious repercussion (no pun but it's your buns that are going to get the spanking). I could not stop myself from digging into spoonful of that rich creamy golden curry with rice and a garnish of barista (caramelized onions). 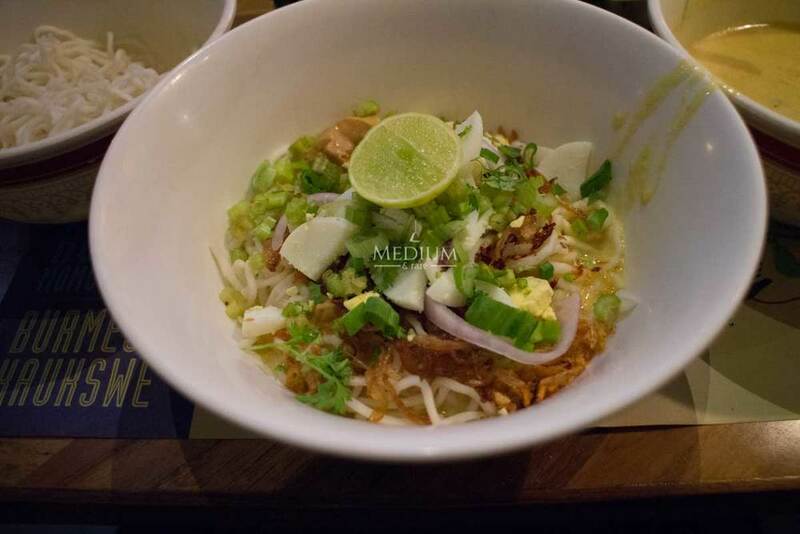 Many years later i was reunited with that dish in 2012, Chef Nikhil Chib who opened Busaba in the 2000's now opened a full blown outlet 'Busago' that was dedicated to just Burmese cuisine. 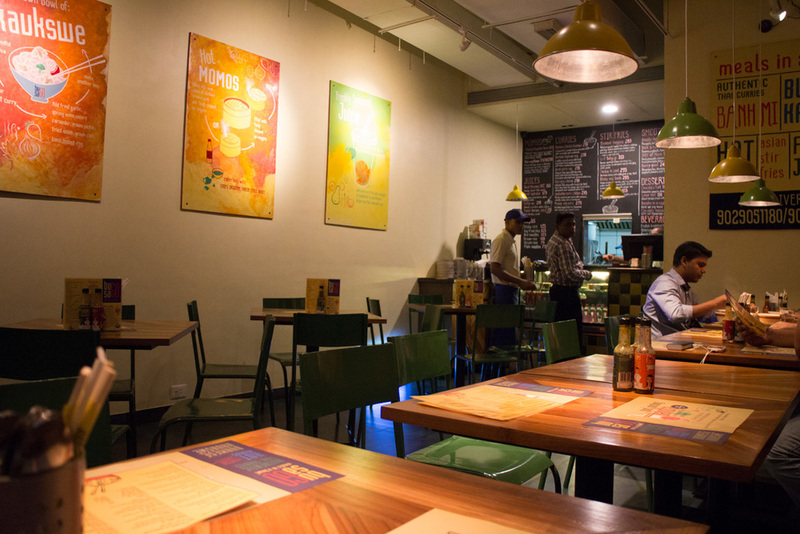 It had to battle the trends of Pastas & Dim Sums and it did quite graciously that they now have 3 outlets in the city. Talking about meal in a bowl, i can compare it to another wholesome affair - Khichda. 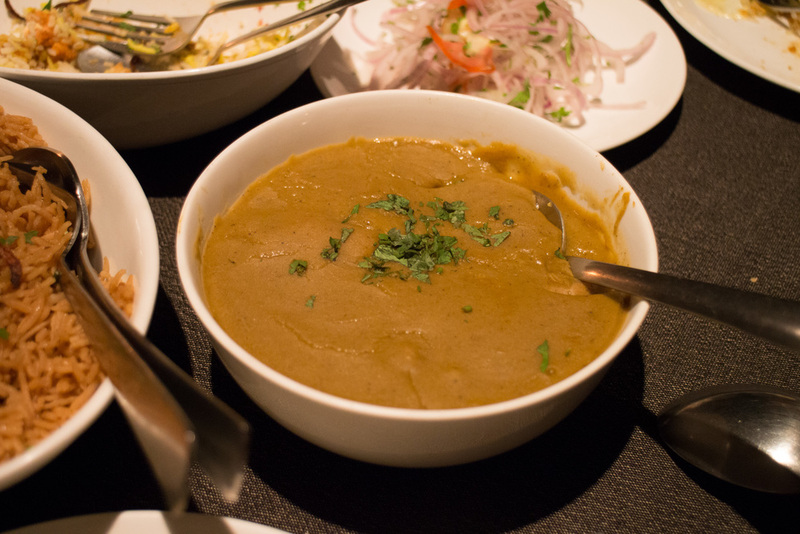 This rather dense paste is made from lentils, pulses & lamb and garnished with barista, chopped coriander and mint leaves. Both are equally filling and sustaining plus the garnish / accompaniments work exactly the same way and cut through the rich texture and bring a zest into your bite. Busago's version spelled 'Kaukswe' is the closest you can get to the original Burmese flavours. Mildly spiced coconut curry with Chicken / Veggies has to be combined with Rice Noodles and an array of accompaniments. As you can see in the picture below, I've combined my portion of noodles with curry and made a heap by adding caramelized garlic & onions, loads of chopped celery, chopped spring onions, slices of boiled eggs, chilli flakes and coarsely crushed peanuts. The base curry itself is so creamy and mellow on the palate that one can enjoy it as a rich creamy soup. It boost of flavours from cumin, turmeric, poppy seeds and more. As you take a spoonful of it, You'll start to experience the different textures and layers of the accompaniments trying to make it's way through the cream curry base. Especially the caramelized garlic that leaves a sticky sensation between the teeth and the celery which shines as the freshest and greenest element. Usually i do not prefer adding any crunchy elements as a garnish in any curry or rice, especially nuts. But every time i'm here i make an exception by garnishing my kaukswe bowl with a teaspoon of the crushed peanuts. While you're here do try their signature Bahn Mi sandwiches (especially the Strong man's) and their curries with either Jasmine or Sticky Rice. - 11, Gasper Enclave, Opp Golds Gym, Pali Hill, Bandra. - Opp. Blue Frog, Mathuradas Mills Compound, Lower Parel. This review and visit was done in July but was not published on the blog. My memories of Parsi food goes back to just one and only place, Dorabjee & Sons in Camp, Pune. The old rustic setting and i remember my cousin sister from UK freaking out seeing chicken drumstick with its skin in gravy, all slithery and slimy. Other than that i have attempted having Dhansakh from Cheron's and the sunday Dhansakh my mums makes with the fragrant brown basmati. 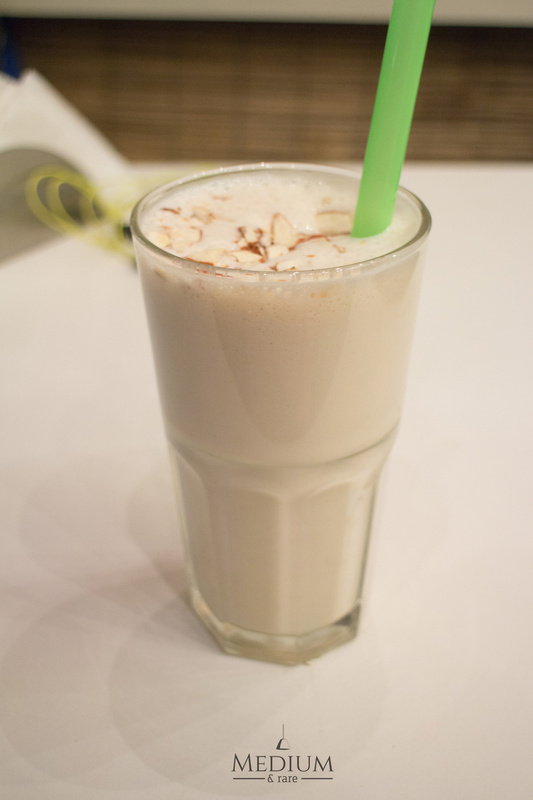 Jumjoji is a more upmarket or better to be called 'Gourmet' Parsi food. 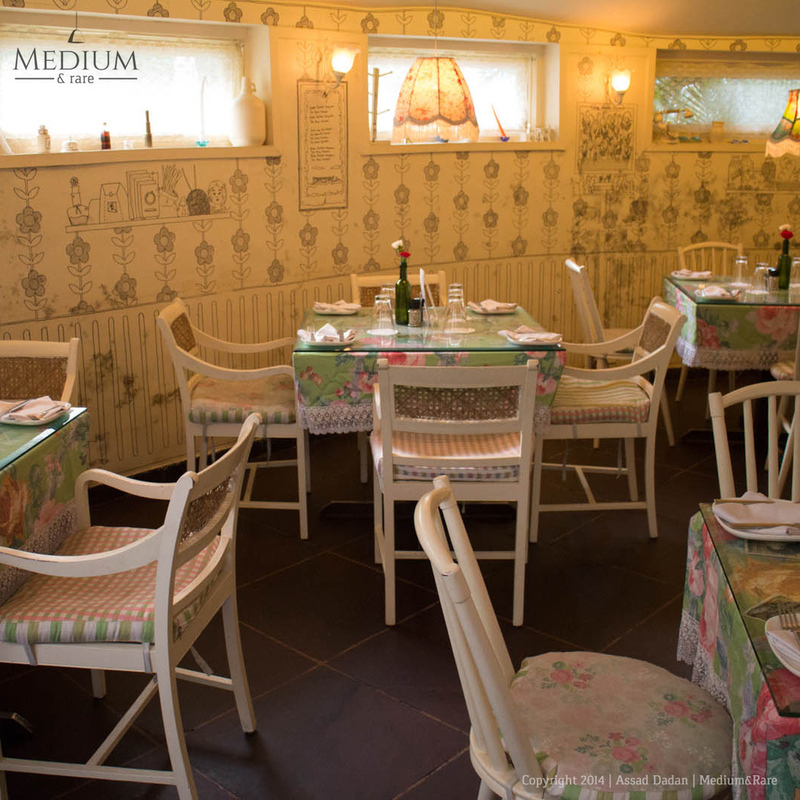 The place is hard to spot amongst the flashy row of eatery on the ONGC colony stretch. Draped in white and wood, the place is bit understated and the interiors bit too tiny. You get to glance on a parsi wall of fame. The setting is candlelight cozy and during our visit the other end of the restaurant was fully blacked out. The menu is crisp and short. 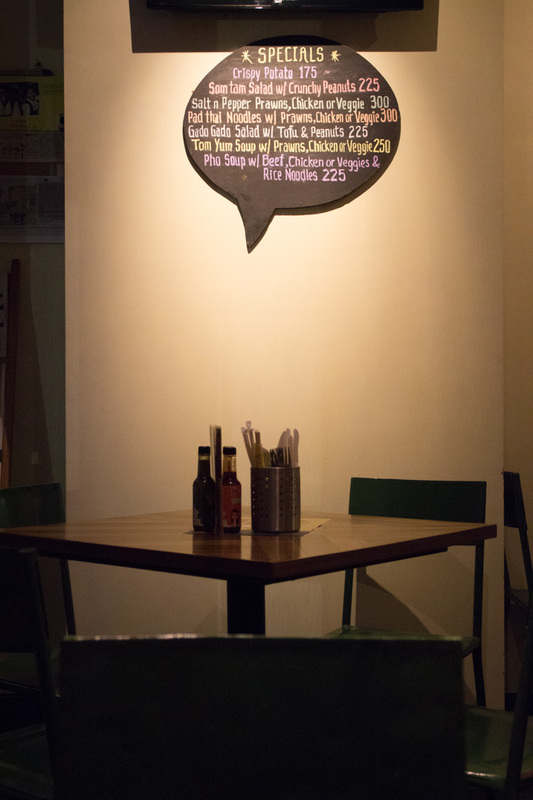 The dishes mainly carry a parsi name like zarine dastoor's hara bhara kebabs and more. Patra ni machi was one of the pre-decided main course item even before we reached the place. Sadly the expectation was short-lived and we were informed that the recent dry spells of mumbai monsoon had lead to jumjoji not being able to get their fillets from the macchi market. The kebabs were ordered, chicken kebabs looked dull and skinny like the cold storage ones but the mutton kebabs saved the start of the night. Perfectly XL sized meat balls, finely minced meat covered in a thin and deep fried crust was just the right portion, a little over-salted but i guess that we all loved it. 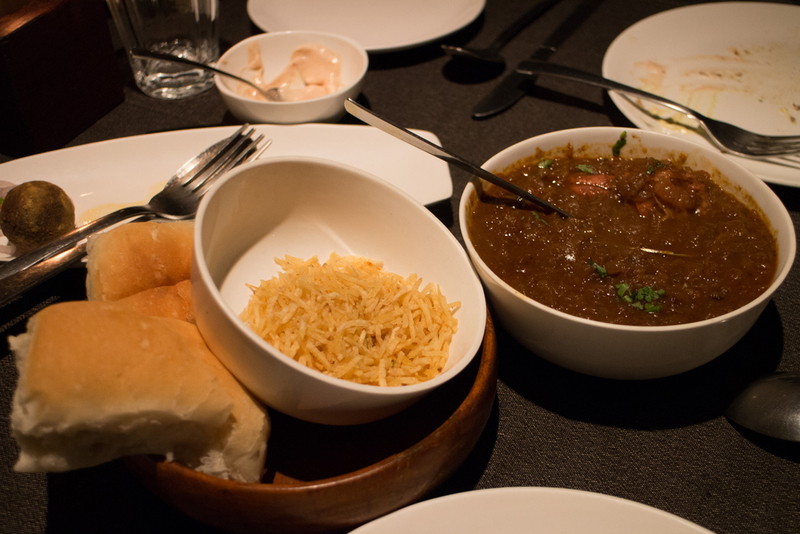 Next up was Mutton Salli with pav. The gravy was bit too sweet and ketchupy for anyone's palate, The ratio of onion to meat in the gravy was bit overwhelming. A simple daily thing like pav was not fresh and felt that such a small yet important binding agent was not paid attention to. Then again the meat chunks saved the night. Every strand pink and as you just pressure with your fingers it breaks apart. The cooking techniques has to be appreciated but the ratio of it's ingredients needs reworking to be true. The Berry Pulao was strictly okay. The chicken bits were hand to find among the colorful layer of rice. The dal that was served with it again was too sweet and didn't help in any way. This was the most disappointing dish of the night. Last in main course was Dhansakh with brown rice. 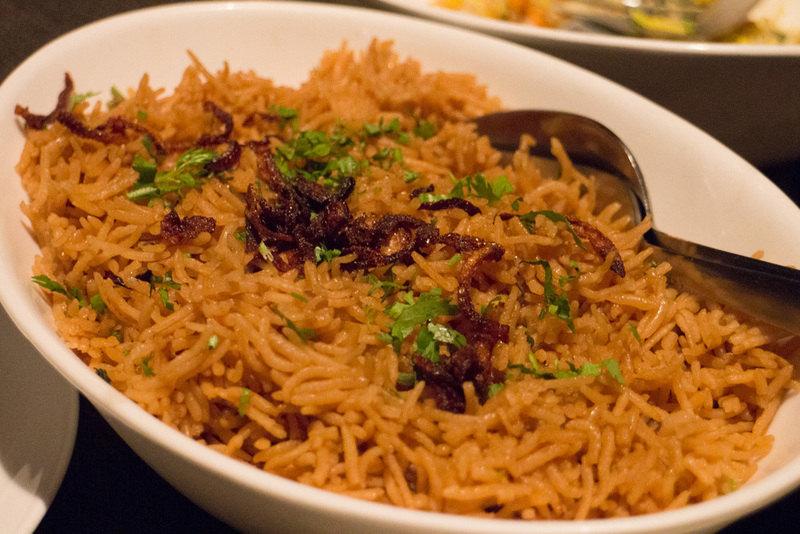 This dish was a complete opposite in terms of portion size and rice quality - hearty and basmati as opposed to the tukda variant of the pulao. The chicken flesh from the dhansakh was yet again skillfully slow-cooked. Moist, juicy and just a little pink on the insides. 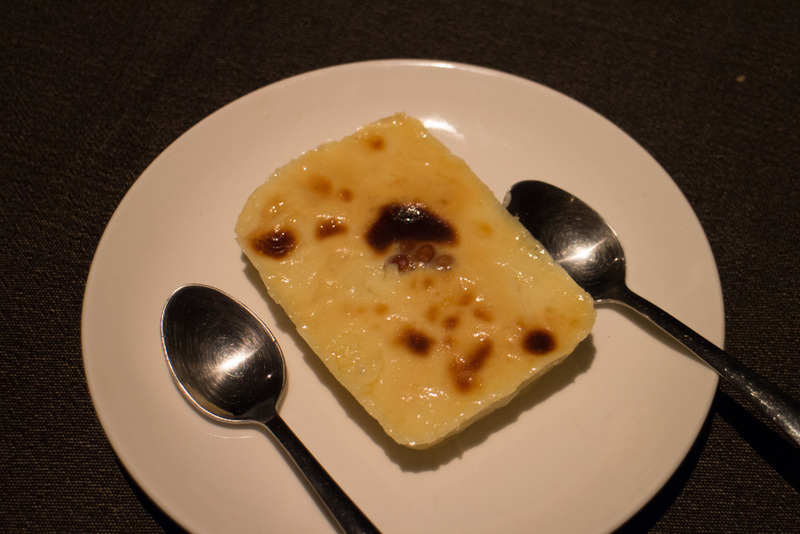 Lagan nu custard was the last to arrive and in my books was just stuckin brilliant. The eggyness is just heavenly in this dish. All that previous inconsistency was blown away in a gust and how ! Basically if i have to sum the experience at Jumjoji, It's a parsi diner with a unwanted twist. The twist is that of sophistication and miserly inconsistent gourmet portions. Hope they improve and soon. 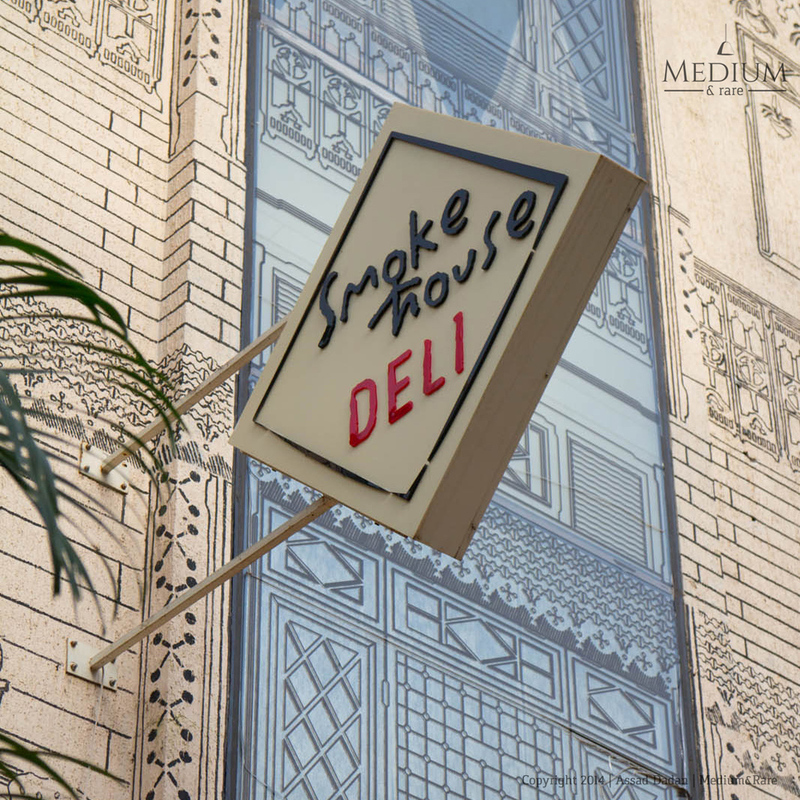 Impresario's SHD is another of it's delicatessen that builds upon the strong base of SWC. With an almost similar menu as the latter, SHD is an identical twin. The menu is slightly shorter yet heavily derived from SWC. Did a quick stop today late afternoon to sip some soup and gobble some sandwich. First up, the interiors are done up extremely well in pastel. Always loved the al-fresco sitting right from the days of Yellow Tree Cafe. With a view of the outside, it's a perfect setup on a gloomy day. Ground floor interiors are pretty in hints of pinks and floral print classic lampshades. The first floor is more communal and perfect for larger groups while the prettiest and the best decor, hands down is on the second floor. The lavish sofa, wooden flooring and classic wooden table compliment each other well. Yet all this lavishness was no good for my favourite al-fresco seats. Was in the mood for Eggs Florentine so got that going first. Followed that with Soup of Mushrooms and Tuna & Sesame Sandwich. First off, the soup (A Couple of Mushrooms) - which is a blend of Shitake, Button Mushrooms and Porcini dust was rich and creamy. In a long time, i haven't had such great pleasure while sipping on a soup. I clearly remember that the Asparagus Soup at SWC was one such experience. Tuna & Sesame s/w was perfect grilled. For half a portion, that is quite a descent size. 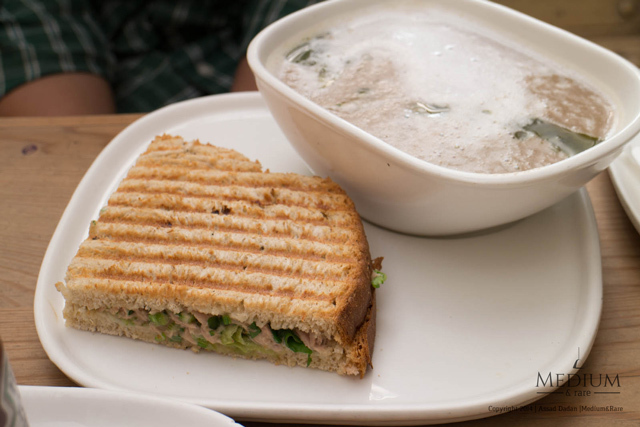 The fibrous feel and taste of tuna is cut well by the celery, balancing each other out. 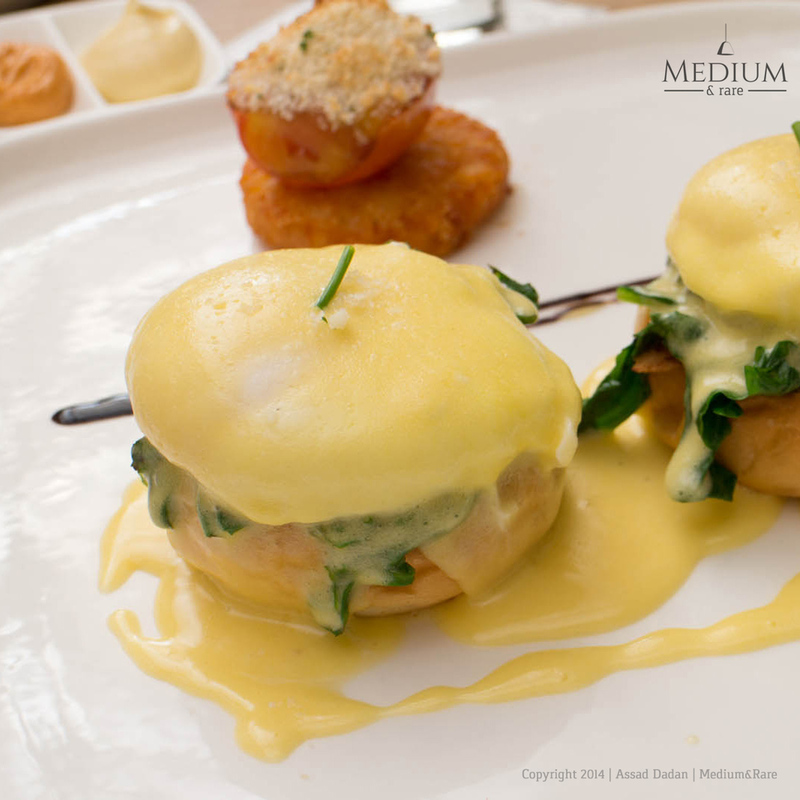 The Eggs Florentine were served perfectly as they should be - Poached Eggs sitting on Brioche Bun and Boiled Spinach topped with a rich creamy Hollandaise. I wanted my eggs to be runny (you have the option of a well done too) - Just so that i can watch the oozing yolk fall over and out on the plate. Love that mess ! Alternating bites of Hash Browns dipped in the sauce and then back to the Eggs with buns and sauce is just a cycle one wouldn't mind repeating for a good 10 mins. To end it, you always have the complimentary bread basket at your disposal. Slap on the butter & jam on those assorted breads and your can close your quick meal with little sweetness. The place mind you, is expensive. All these exquisite flavours are only possible by procuring the best & fresh produce from the market. Hence, once in a while i don't mind it at all. If something touches your culinary side of the soul and comforts you, you shouldn't have a reason to complain. A special shout out to my man - Nelson, who took good care of us. Thanks buddy ! There are burgers, and there are double whoppers and then are massive open face burgers. The last one is by all means a mammoth task. Visited #HungerPangs late last evening after hearing some good bits about it, even though my presumptions were overpowering the views from many people. The place has a very calm and relaxed atmosphere. Dim lights and lanterns on tables make up for a descent conversational dinner. The menu is very deli type featuring Burgers, Cheese Logs, Beef Bolognese and Sandwiches. Service is quick and with smiles. Yorack - the man behind the ka-ching counter makes sure he has a feedback from almost all of his customers. 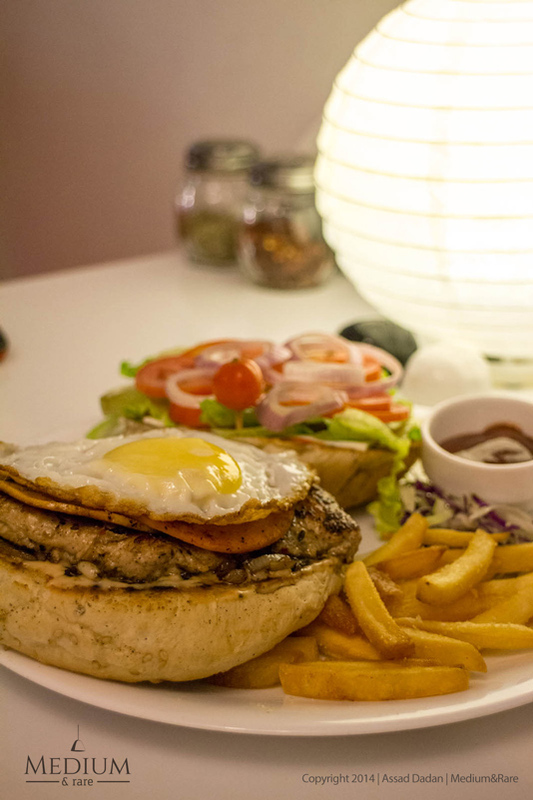 The open face - 10 oz Legendary Chicken Burger is a must have dish. 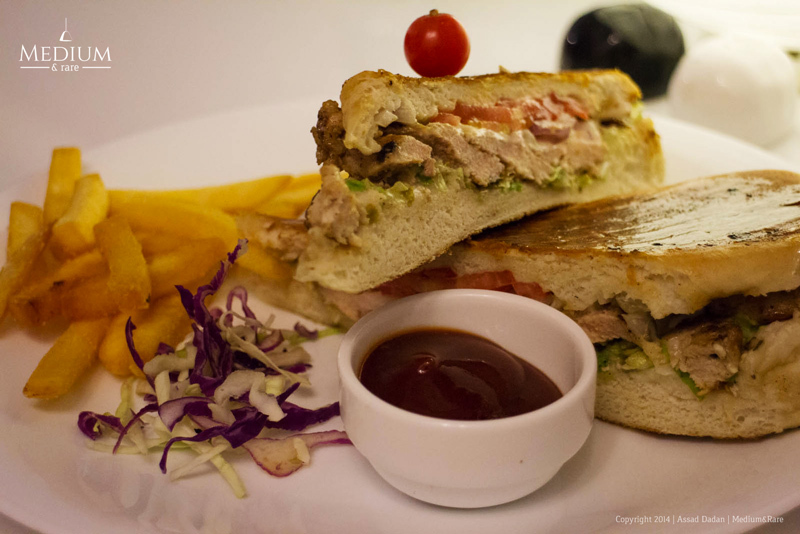 Stuffed with Grilled Onions, subtly flavoured Chicken Patty, Salami, Sunny side up, Sliced Onions & Tomato and Iceberg, it is one heck of a messy affair. The XL size of the serving itself is enough to put anyone into a food coma. The question is - Where does one begin from ? Cap the burger to begin the ritual and the egg yolk ruptures and oozes all over the burger layers. The stacking is neat and well balanced that nothing seem too dominating in flavours. The Sandwiches are massive too. 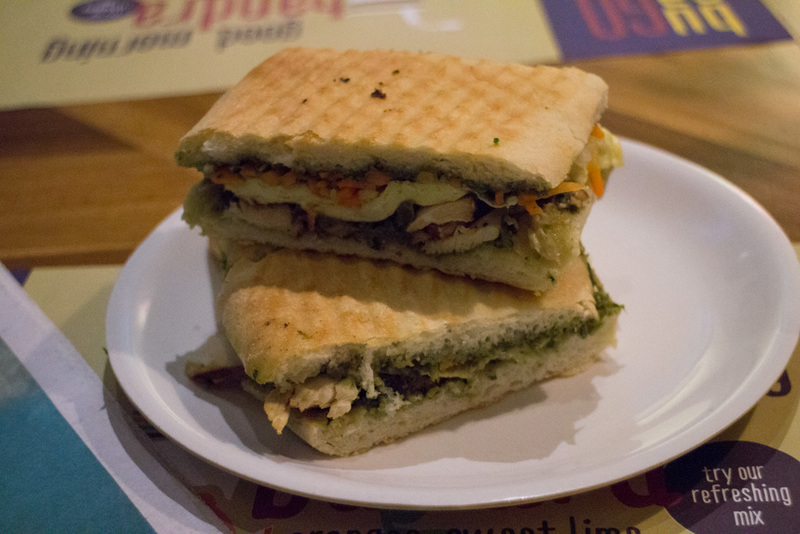 Had ordered the Chicken Caesar S/W and it was served in a much Panini avatar that a regular sliced loaf. Loved that switch of bread as the texture is different and all the ingredients fit well inside the casing. Again, flavours are right there and well balanced. Do give it a try, I sure am going to yet again in this week for it's Pasta & Starters. What i love about this place is that the team behind it knows what they want to serve (limited american fast food & tex-mex dishes) and serve them well with perfect execution. Just in case it's hard to locate the place - It's opp Nature;s Basket on Hill Road.